Color Displays Coming to E-Readers? Qualcomm had its Mirasol display on show at Wednesday night's MobileFocus event at CTIA in San Francsico, and we got to check it out up close. 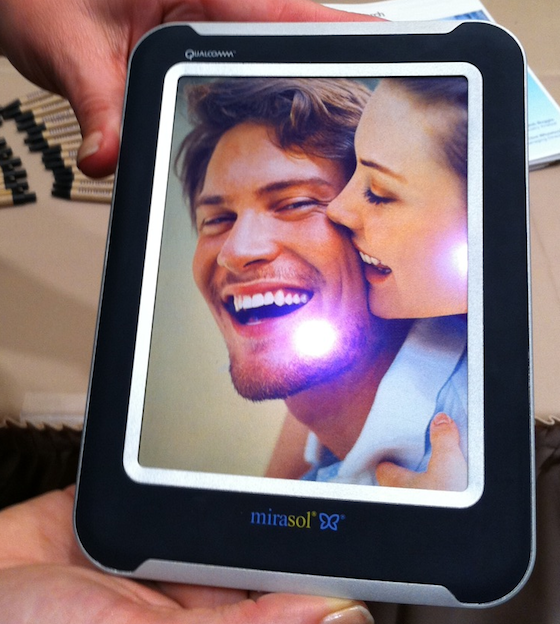 We previously got a look at the Mirasol display at CES. At MobileFocus, Qualcomm told me that products using the Mirasol display should be announced during the first quarter of 2011. The Mirasol display can show around 45,000 colors, according to the Qualcomm representative I spoke with. While that's a far cry from what LCDs can handle, it's still pretty impressive considering Mirasol's other advantages, and the fact that it's a new technology. Also, Jesee Burke at Qualcomm says that, "given the reflective nature of our display, measuring colors [on Mirasol] is a very different endeavor than with traditional LCDs," so the color depth numbers may not be directly comparable. Mirasol is neither an E-Ink or LCD screen, but it has characteristics of both. It's a reflective display like E-Ink--there's no backlight, so it relies on ambient light for the image to be viewable. But like an LCD, Mirasol can handle motion; Qualcomm says it can handle 30-frame-per-second video, but the demo I saw was running at 15fps. The color wasn't quite true-to-life--again, the color depth is still somewhat limited on the Mirasol display--but it was still impressive for what Mirasol is. Text was crisp and readable, much like it is on an E-Ink display. We were in a well-lit room, so I couldn't tell how well it would perform in either very bright or very dark conditions. In either case, Mirasol appears to be a promising technology. It'll be interesting to see what sorts of products it ends up in, and how the technology develops from here. Updated 10/7/2010 4:24PM PDT to clarify and provide additional information on Mirasol's color depth.